By Dr. John Provan, Kelkheim/Ts. Unlike any statesmen before and since, George C. Marshall influenced post-war Europe, probably more than any politically elected individual in history. Truly he can be called a "General for Peace", whose story is not only unique, but inspiring. Born on December 31, 1880, in the conservative countryside of Uniontown, Pennsylvania; he was the third child of George Catlett Marshall and his wife Laura Bradford Marshall. Although not a good student in school, the subject matter of history caught his interest. As a child. George was fascinated by the local illegal "Cockfights" (Rooster fights). His father favoured George's brother, Stuart and his younger sister, Margaret, who was by far the better student. The family could look back upon a long patriotic lineage that included a Chief Justice of the United States, John Marshall (1755-1835). When it came time to attend college, in 1896, George at the age of 16, gladly went to Virginia Military Institute (VMI) at Lexington, Virginia. Many relatives had attended this renowned institution, from which a cousin, COL Charles Marshall had graduated and served as an aid to GEN Robert E. Lee, during the American Civil War. In a letter to the superintendent, Charles recommended that George be admitted to VMI; and to the surprise of many, he was accepted. During his years at VMI, he quickly learned military drill and regulations, which brought him through the ranks, receiving a commission as 2nd Lieutenant on February 2, 1902. A few days later, he married Lily (better known as Elizabeth Carter Coles), who he had met years earlier, since she lived near the gates of VMI. It had been love at first sight, but suffering from weak heart she was unable to bear children, a fact which did not influence their happy marriage. 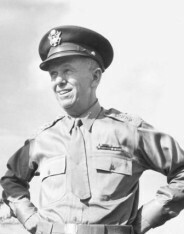 Only a few months later, 2LT George Marshall was ordered the Philippines, which was subjected to civil fighting. At the small outpost near Mangarin, he gained his first experience of war and commanding soldiers. After 18 months, he returned to the United States, where he was promoted to 1st Lieutenant in March 1907. 1910, found Marshall mobilizing troops to beset the Mexican Revolution. In August 1913, he was assigned once again to the Philippines to counteract the phenomenal ruthless colonial growth of Imperial Japan. He predicted, it was only a matter of time before Japan would conquer the islands. Little did anyone know, how right he was. A short time later, World War One broke out in Europe and in October 1916, he was promoted to Captain. He became assistant Chief of Staff, serving GEN William L. Sibert's First Division, as part of the American Expeditionary Forces, landing in France on June 26, 1917. The First Divsion spearheaded a 2 million man Army, commanded by GEN John J. Pershing. With the fall of the Eastern Front, due to the Bolshevik Revolution, Germany threw 100 battle tested Divisions against the fresh American Army along the French Eastern Front, in an offensive which began on March 21, 1918. As an organizer of men and a planner of battles, Marshall failed to gain a field command, but was so successful in his duties, that GEN Pershing transferred him to his command staff. Amongst his accomplishments, was the movement of 400,000 U.S. soldiers, with 3,000 cannons, 40,000 tons of shells and 90,000 horses, covering a distance of 100 miles. Many of his men were forced to walk to lessen traffic along the small road. The German Army failed to withstand the ceaseless Allied attacks and on November 11, 1918, the war came to an end. Marshall remained in Europe, organizing the Occupation of the Rhineland by U.S. troops. It was while with GEN Pershing, that Marshall met many world leaders and gained much first-hand experience in politics. Together they returned to the United States in September 1919, and led a victory parade of 25,000 veterans down the streets of Washington DC. The Marshall family would remain in Washington DC until 1924, when GEN Pershing retired, Marshall was given command of 15th Infantry Regiment in Tientsin, China. He and Lily would remain in China for the next three years. In 1927, he returned to Washington DC, to become an instructor at the Army War College. On September 15, that same year, Lily suffered a heart attack and suddenly died. Her passing struck George hard. He moved to Fort Benning, GA, in October and became head of the Academic Department, where he began his famous "Black Book", noting the names of officers who impressed upon him their outstanding abilities; an invaluable aid when America sought good officers to fight World War Two. It was during this period, that George met Katherine, whom he married in 1930. In 1933, Marshall was assigned the task of organizing a group of 500 Civilian Conservation Corps youth, as part of President Roosevelt's employment efforts to get the American economy going again, after the Great Depression. At Fort Screven, under Marshall's guidance, this figure soon rose to 4,500. 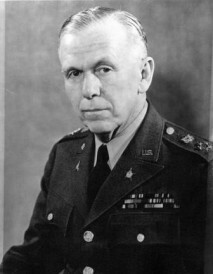 By 1936, George Marshall was given his first star and the rank of Brigadier General. With the world on the edge of war and the foreboding of conflict in both Asia and Europe, President Roosevelt decided to appoint now General George C. Marshall as Army Chief of Staff, an assignment he entered on September 1, 1939; the same day Hitler's army attacked Poland. Only months later on December 7, 1941, the Japanese attacked Pearl Harbor, forcing America's entrée into the war. Ill prepared, out numbered and poorly equipped, Marshall now suffered the shortcomings of years of financial neglect that the American Congress had imposed upon its military forces. Much of the equipment was dated from 1919, most of the fleet had been destroyed, and not enough American men were in arms to fight such a war. Marshall helped organize the rapid production of war-time equipment, create an Army that would engage only when ready, despite the political efforts of Churchill and even Roosevelt to deploy our military in piece-meal fashion. Once this Army was ready, Marshall was given the assignment he had dreamed of since entering the service, he was promoted to General of the Army; a rank held by only eight officers in American history. He now commanded the largest military force America had ever assembled, which now was successfully fighting it's way across Europe. Soon two bombs were to end the fighting in the Pacific, with the signing of surrender documents onboard the USS Missouri. On September 2, 1945; World War Two came to an end. 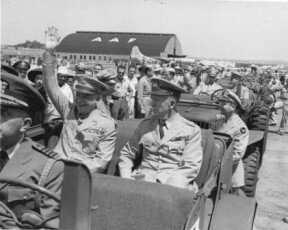 President Harry S. Truman, then sent GEN Marshall to China, in an effort to create a coalition between the Nationalists led by Chiang Kai-shek and the Communists led by Mao Zedong. When his efforts failed, with the ensuing civil war being won by Mao, Marshall returned to the United States. On January 21, 1947, he became Secretary of State. The following years saw George Marshall becoming US Secretary of State, creating and executing the Marshall Plan (for details, please read the separate section "The Marshall Plan"). 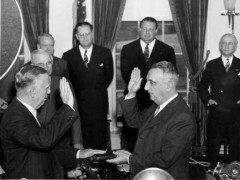 Although Secretary of State Marshall had served his country well, President Truman asked that he now act as Secretary of Defense. Marshall only held this position for less than one year, between 1950 and 1951, during which time he managed to re-build the Army after it's post-World War Two demobilisation period and restored confidence within the command. After the North Korean Army had succeeded in forcing US Army's 24th Division to retreat, America was now able to regain lost territory, resulting in an armistice being signed on July 27, 1953, with a new border along the 38th Parallel. 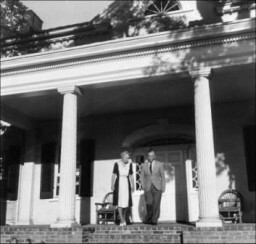 Upon leaving public service in September 1951, George and his wife Katherine, moved to their southern style plantation home in Leesburg, VA, known as Dodona Manor. The Marshall family had acquired the property in 1941, for when he retired. Unfortunately, George Marshall's health soon began to fail, he became deaf and his memory began to falter. He suffered one stroke after the other, while hospitalized at Walter Reed. He died on Friday, October 16, 1959. Katherine remained in Dodona Manor and passed away some 20 years later, on December 18, 1978. George C. Marshall is buried, together with both his wives, Lily and Katherine, in Arlington National Cemetery (section 7), in Washington DC.